Life in the Hive: It's a Bee! 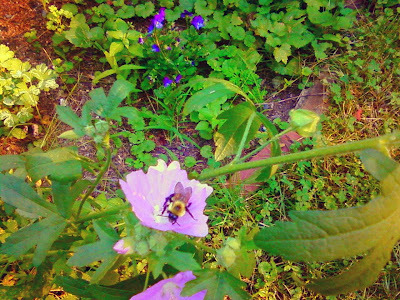 Check out the bee in our "garden"... its mostly just weeds. I wanted to see what would grow in the garden first before I try my hand at gardening. I've been awful at it so far. Mostly I've just tried growing indoor plants and they usually don't last too long or the cat eats them. She at my last plant that had actually lasted for a couple of months. It probably lasted so long because she's was living upstairs. She just finally got used to the dog and has been venturing down stairs more often. Oh well, maybe next year we'll have a nice pretty garden outside. 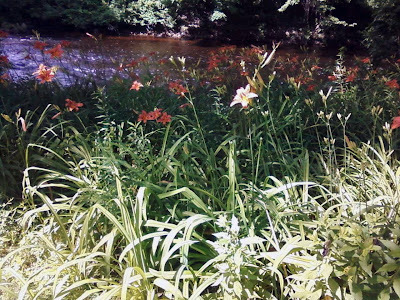 We do have a nice pretty bunch of daylilies by the river, those are nice and hopefully my black thumb wont have an affect on them. Oooh and I'm trying to grow some tomatoes in pots. Derek came home with the plants one day. They haven't died yet. There are actually a couple of green tomatoes growing on them. 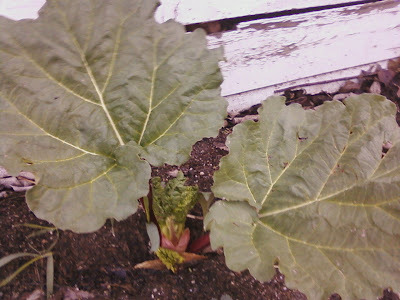 :) And there has been some rhubarb growing since the spring. Who knew it had such huge leaves!